Wetsuits are an amazing tool that let surfers, swimmers, and water lovers alike stay in the water all year long. Choosing the right thickness of wetsuit for the area and activity that you will be doing is the first step to staying warm and happy, ready to focus on fun. We have one of the largest selections of wetsuits on the web, a super knowledgeable staff and expert guides. How Should Your Wetsuit Fit? One of the most important aspects when considering wetsuit warmth is the thickness of the neoprene. Wetsuit thickness is measured in millimeters, represented with two or three numbers separated by a slash. The first number represents the thickness of the neoprene in the torso area, the second number represents the thickness of the neoprene in the extremities (or just the legs if there is a third number), and the third number (if present) represents the neoprene thickness in the arms. 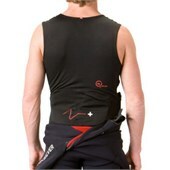 The thicker neoprene (the first number) is used for your torso in order to maintain your core body heat. Your core heat is extremely important to maintain in order to prevent hypothermia. The thinner neoprene (the second/third numbers) are used for your extremities. The thicker the neoprene, the more warmth but less flexibility; thus the thicker neoprene is placed where you need less flexibility (your core) and the thinner neoprene is used where your body is constantly in motion (arms and legs). Please note: For cold air temperatures, more wind, an activity with less movement or if you get cold easily, consider a thicker wetsuit. These are general temperature guidelines. Many brands will provide their own temperature recommendations that may differ slightly from those listed above. Fit is a very important aspect to consider when buying a wetsuit. If your wetsuit does not fit properly it will not be able to keep you warm or allow you the mobility you need for your sport. Consulting brand-specific size charts for wetsuits is the best way to start finding the correct wetsuit fit. A wetsuit should fit like a second skin with no sagging in the back or excessive bunching in the arms or legs. It should fit tight in order to keep only a thin layer of water between your body and your suit. If your suit is loose, an abundance of water will flush through, making the suit less effective at keeping you warm. A wetsuit should also fit snugly around your neck (many people wear a rashguard underneath their wetsuit to prevent a neck rash). Most women wear a swimsuit underneath for extra protection and support. Once on, lift your arms over your head and stretch out your shoulders. This move should only be slightly restricting. If you feel a lot of pressure during this movement then the suit is too small. You should be able to squat down and move your arms easily (wetsuits above 5/4mm are inherently restrictive). *Each brand has a slightly different fit; make sure to shop for your body type. Check out our guide to How To Put on a Wetsuit. Lies flat against your body, causing no discomfort. May let in a little water. These stitch panels are glued and then blind stitched. Blindstitching does not go all the way through the neoprene. Instead, the stitch comes out the same side it went in, making it watertight. This seam style will let in very little water. This stitch is glued and then blindstitched but it also contains interior seam taping. The interior taping will add durability, reinforce the seam, and prevent any water from seeping through. There is more to getting into your suit than you may think. There are three types of wetsuit entry constructions: back zips, chest zips and ziperless. This is the classic solution with the zipper going down the length of the spine with a long cord attached so you can zip yourself in and out. The advantage of a back zip is that, relative to the other styles, it is typically the easiest to enter and exit. This is a big deal when you are trying to get into something that is skin tight. The disadvantage is that water can get through the seams on the back zip, which in cold water can become a major deterrent (think ice cubes down your back). Many companies have come up with their own flush guard technologies to reduce this from happening (e.g. Quiksilver Hydroshield). Also, when you are bending forward, the suit will go taut in the back and the zipper lacks give, which may restrict movement. Chest zip wetsuits are entered through a zippered cutout around the neck and you drop down into the suit through the neckline before pulling the neck cut over your head and zipping closed at the chest. Chest zips are the trickier of the two types to both enter and exit. The chest zip is superior at keeping water from penetrating the suit through the seams and the neckline. The chest zip may also be a more comfortable fit once on with a snug neck that is less likely to cause rashes and the zipperless back yields a greater level of flexibility. Found on lighterweight (think 3/2 and thinner) wetsuits and neoprene tops, these suits prioritize mobility over warmth by eliminating the lack of flex found around zippered areas and stitching. This may be a good solution if you have issues with mobility while paddling or surfing. The entry point for zipperless wetsuits can be found around the chest or neck area and is usually secured by a small zipper, elastic or velcro. A full wetsuit covers your entire body -- these suits can be found in many different thicknesses made for different water temperatures. Full suits cover the entire body including arms and legs up to wrists and ankles. Shorties, springsuits, short johns and wetsuit shorts - they all feature thinner material and short legs and arms and are primarily used in warmer water temperatures. Exactly like a full suit but made with thinner neoprene (usually 1.5 to 2mm) and no material at the arms, for warmer waters. Tops or vests made out of 0.5-2 mm neoprene that can be paired with boardshorts or a bikini bottom, primarily used for warmer water sports. Wetsuit vests can also be layered under a full suit for extra warmth in cold water. Neoprene pants, leggings or shorts primarily used in warmer water temperatures. A light shirt made out of Lycra or other UV resistant materials. Used to protect against sun and sand, sometimes worn under a wetsuit to prevent irritation. Some wetsuits use FAR infrared technology to keep you warm. This technology has two forms: Suits featuring mineral-enriched fibers that capture your body heat and convert it to FAR Infrared rays in order to keep you warm are the most common, while some companies offer more powerful battery powered heated undershirts and suits that use a small controller. A FAR Infrared Ray is a spectrum of sunlight with a wavelength between 4-1000 microns. NASA discovered that a Far Infrared Ray between 6-14 microns is capable of penetrating the human body, raising body temperature while improving circulation and stimulating cell growth. Using this technology with a normal neoprene wetsuit allows you to wear a thinner wetsuit in colder water, increasing your flexibility. Being cold drains your energy and cuts down your time in the water. Normal wetsuits are only able to insulate and reduce heat loss, but these wetsuits actually have the capacity to generate heat. This generated heat will keep your core body temperature up, allowing your heart to continue pumping blood to your outer extremities instead of purely focusing on keeping your core warm. Most heated wetsuits or heated under-articles are controlled by batteries and a small hand controller allowing for maximum freedom of movement. In water colder than 60°, wetsuit accessories such as gloves, boots and hoods help you stay warm. Neoprene gloves or mittens for cold water activities. Five finger gloves provide the most dexterity, while mittens are best suited to very cold water. Three finger hybrid models also exist (think lobster hands). Neoprene and rubber boots for cold water activities. Wetsuit booties can have a round toe or split toe. External split toe designs have a separate big toe for better dexterity, while internal split-toe models combine the dexterity of split-toe with the warmth of a round-toe design. Hoods can be added to hoodless wetsuits for additional warmth in colder waters. Some wetsuits have hoods built-in.